This is an older home education classic. The latest edition was put out in 1995. It has a lot of good stuff in it, especially for someone just considering or starting homeschooling, though it's perhaps a little outdated for today's reader. It's largely written to persuade an audience concerning the merits of home education and that it can be workable. It seems to me that I checked this out from the library at some point early in my own homeschooling journey, though I'm not entirely certain. I think I checked out about everything there was on the topic way back when (which wasn't a whole lot, but it's likely this was there at some point) -- didn't read everything, but at least perused pretty much whatever I could find. I purchased this now because I wanted to get Gregg Harris' perspective on delight-directed learning, not because I wanted to be persuaded to homeschool (although, some days... :D ). So that portion was about all I read carefully. I scanned some of the rest of the content and read many of the chapter summaries to see if there were areas I wanted to read more in-depth, but since I've been immersed in homeschooling all these years the content was on familiar themes, I'm familiar with his viewpoints on them in general, and I didn't want to take the time to read it all right now. I appreciated his thoughts on delight-directed learning. If you look for this book, be aware that the first edition does NOT include the chapter on delight-directed learning (which I learned after I bought it -- oops! -- be sure to get the 1995 edition if you want that chapter). I'm a homeschooling mom of 7 children ages 12 and under, so I'm not a newbie anymore. But I still enjoy reading books that address the issue or why and how to homeschool. I think when the revised version of this book was issued in 1995, I'd probably have given it 3 or even 4 stars. However, in almost 20 years, some significant changes have made the book dated, such as more homeschooling styles, more homeschooling resources, technological advances, etc, and there are more books on homeschooling available. This book did well with a lot of the whys for homeschooling, but was weaker on the hows, largely because of the passage of time. This book gives encouragement for Christian families to "Raise their children up in the Lord." 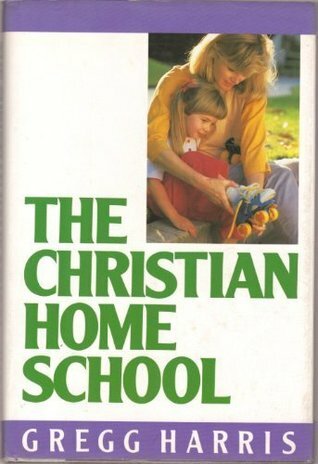 Although I didn't get much, personally from this book, I can see that it would be a great intro to Homeschooling to hand wondering neighbors or relatives. Good, but a bit outdated. Some info is timeless. Gregg Harris - Gregg Harris is a follower of Jesus Christ who serves as a practical theologian, social philosopher and local church reformer/pastor. He attempts to walk in the giant footsteps of great men such as Martin Luther, John Calvin, Abraham Kuyper, Theodore Roosevelt, Francis Schaeffer, Dr. David Wells, Dr. Albert Mohler, Dr. Wayne Grudem and Dr. John Piper. He currently serves as a Teaching Elder of Household of Faith Community Church, in Gresham, OR (see hofcc) and as the Director of Noble Institute for Leadership Development, a not-for-profit educational organization (see nobleinstitute.) Gregg is internationally known as a pioneer advocate in the Christian home schooling movement, author a best selling book, The Christian Home School and developer of The Noble Planner Time Management System. He is the husband of Sono Sato Harris, and the father of seven children, among whom are, Joshua Harris, author of I Kissed Dating Goodbye, Joel Harris, Director of the Northwest Academy of Worship Music, Alex & Brett Harris, founders & co-hosts of TheRebelution web site, and three others still in their younger years.